But there are many missing pieces in that big jigsaw. Service management, while unspectacular, is a critical component of the digital underbelly of the OneOffice as HfS has termed it. As ServiceNow is aiming to expand the notion of service management to evolving into the “third estate between CRM and ERP,” providing a new cloud-based level of efficiency between front and back office, we have asked our Intelligent Automation expert in residence, Tom Reuner, to take stock as to where the ServiceNow ecosystem has advanced to. Tom, there appears to be a buzz around ServiceNow in the industry? Is the hype justified and where does it fit in strategically for buyers? Amidst the marketing noise in our industry, ServiceNow still stands out. And that, Phil, is quite an achievement as service management is really not among the sexiest of topics. You can see that in thousands of developers and partners having made their pilgrimage to Knowledge 16, ServiceNow’s customer event in Las Vegas this year. Crucially though, ServiceNow has expanded from the early focus on ITSM and from the slightly blurry yet smart positioning as “Enterprise Cloud Company.” Industry stakeholders are rather enthusiastic about the single data model, the embedded workflows and new ways of collaboration. As such, ServiceNow has the potential to evolve into one of the key building blocks for moving toward As-a-Service because its core value proposition centers on clients accelerating their time to value through faster actions and interactions, overcoming clunky legacy solutions like ITSM. With that in mind, the focus is on working toward a real-time single pane of glass: The ability to communicate, collaborate and manage IT and operations in real-time is at the heart of ServiceNow projects and thus strongly aligned with the notion of the As-a-Service. Yet, only few providers articulate this as part of an innovation journey. Leading proponents that actually do this are Linium and Infosys. And this points to a broader challenge. As ServiceNow is expanding its capabilities, providers have to find a common language between IT and business: The marketing and go-to-market messaging is largely stuck in an ITSM centric mindset. The language is dominated by function, features and copious amount of jargon. However, the more ServiceNow is moving beyond the core ITSM capabilities, the more the messaging has to be adapted to this new set of non-technically minded stakeholders. More broadly speaking, for buyers ServiceNow can help to make business alignment finally a reality: Several stakeholders we spoke to referred to ServiceNow as having the potential to evolve into the “ERP for IT.” Yet, business leaders rarely get involved in the planning process and often wait till “IT got its house in order.” Thus, there is a disconnect between the ambition to establish ServiceNow as the operational foundation and the implications to manage and run the business. How are the winning service providers approaching ServiceNow services today? What are they doing beyond the bread-and-butter basic ITSM services? 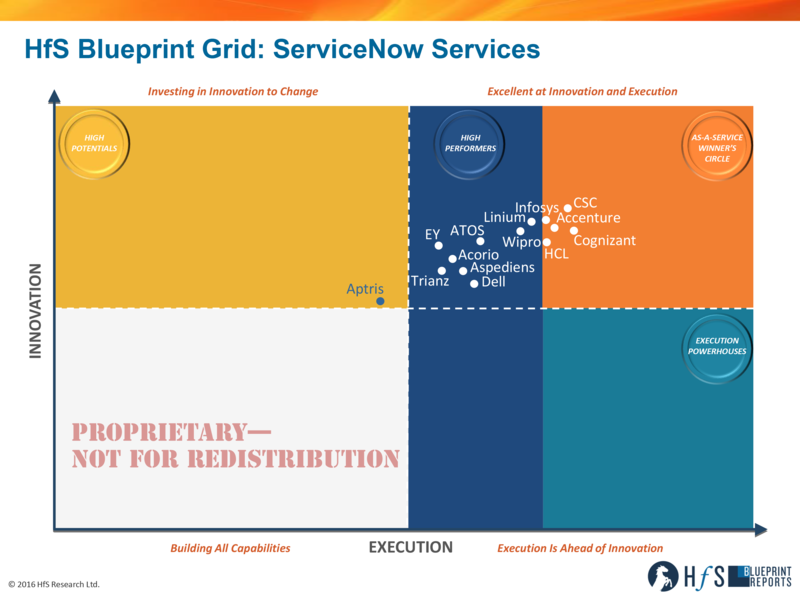 Phil, the market is still in a nascent phase of development and therefore we see a fragmented service provider landscape: Revenues from ServiceNow Services for individual service providers are still below $100m from the leading providers, indicating a small fast growing market. There is plethora of start-ups and boutiques that will drive innovation and find their place in the growing ServiceNow ecosystem. ServiceNow aims to be the Third Estate between the front and the back-office. At same time it aims to expand toward the front office. Thus, comparison with Salesforce is unavoidable. With that in mind, providers are evolving from the initial focus on ITSM capabilities toward what ServiceNow calls Enterprise Service Management. Thus we see them expanding into business functions such as HR, Facilities, Legal, etc., thus overcoming the traditional barrier between IT and business. Leading proponents are Linium, with CSC and Accenture catching up. But we see also ServiceNow being increasingly integrated into vertical offerings and well as frameworks and accelerators offered. Accenture is leading the space, with Cognizant catching up. Beyond that we would highlight innovative offerings around security and IoT. ServiceNow has acquired BrightPoint Security to close the gap between IT operations and security. As a result, CSC, EY and Acorio have started to build out capabilities. Similarly in IoT, While nascent and at proof of concept stage, providers like Aptris and EY are starting to experiment with IoT scenarios. And lastly, of course SIAM/MSI is the logical evolution from the starting point in service desk projects with Atos, HCL, Wipro and Accenture being the leading proponents. Surely, it is not all plain sailing, Tom. Where are currently the main challenges around ServiceNow services? Two issues are jumping to mind: The battle for talent and the lack of clarity for the direction of travel. As the ServiceNow ecosystem is still nascent, talent remains scarce. In many projects staff is being trained on the job with varying degree of success. Consequently, organizations have not always seen an alignment from sales process (and promises) and delivery. On the other hand the direction of travel remains a blurred picture: While an organization’s starting point is firmly rooted in ITSM capabilities with a view to overcome clunky legacy tools, the eventual destination is blurred at best. Crucially, the motivation for ServiceNow adoption lies more in embracing a single data model than the allure of cloud-based services. Yet, consulting capabilities that go beyond ITSM are scarce and many provider follow a “land and expand” approach. Many organizations we spoke to outlined that service providers fail to proactively propose innovation and help buyers with a clear outline of the future state. The hype around Intelligent Automation keeps bubbling on days, to put it mildly. So where is ServiceNow fitting into that picture? Phil, the disruptive element of Intelligent Automation is decoupling routine service delivery from labor arbitrage. Therefore, service providers remain comparatively and unusually coy on the topic, so I am struggling with the term “hype.” Rather, I see hesitation and confusion out there. Having that said, the market development is noticeably maturing. A reference point for that is the service orchestration around the notion of Intelligent Automation that is starting to set in. Providers like Atos, TechMahindra and Hexaware are starting to standardize service delivery on ServiceNow, link this up to orchestration engines like Automic or Cortex and put the plethora of Intelligent Automation on top of that. Thus, ServiceNow is becoming part of the broader discussions on service delivery and automation. 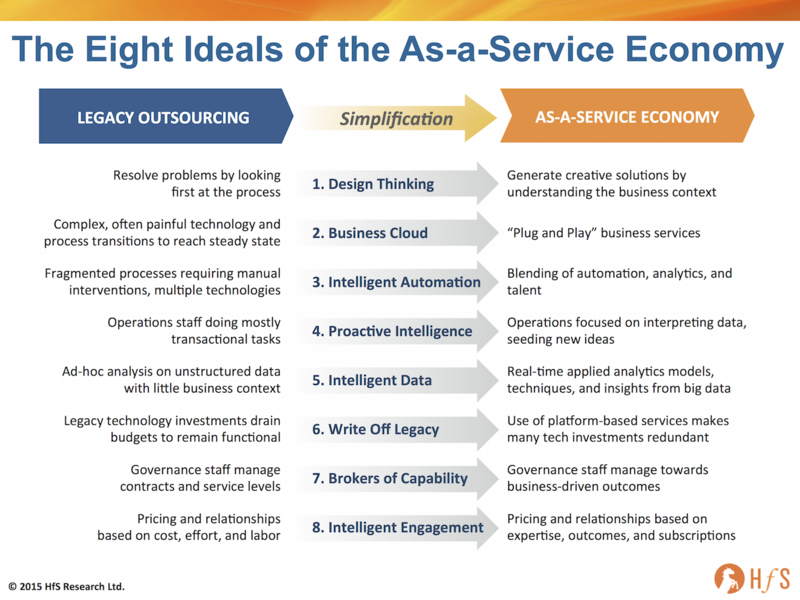 Does ServiceNow have the potential to move center stage in the As-a-Service Economy? How do you see the market evolving in the next few years? As I have outlined, stakeholders suggest that ServiceNow has the potential to evolve into a critical building block for the As-a-Service Economy—not least because of its single code and data model. Yet, ServiceNow itself has been slow in embracing the notion of an ecosystem that goes beyond treating partners as mere sales channels. This is starting to change though, which is critical as the notion of the As-a-Service Economy is predicated on a collaborative partner ecosystem. Partners would like to see more investments in joint marketing and joint capability development such as vertical offerings. In order to progress toward the As-a-Service Economy, the supply side needs to invest in consulting capabilities that go beyond technical consulting. In our discussions with clients the lack of proactive innovation and the struggle to provide guidance on the future state of operations have been as vocal as consistent. But we will see more M&A activities as the juggernauts will continue to build out capabilities. During the project CSC did acquire Swiss Aspediens and we expect to see many of the boutiques absorbed over time. Thus, we look forward to extend the discussions beyond the organizations that we have covered in this report.